This article by Robert Loerzel originally appeared in Pioneer Press on December 3, 2008. When John Mahoney needed a refresher course on how to do a Dublin accent, he went straight to an expert — the acclaimed Irish actor Gabriel Byrne. “Does it help!” Mahoney says. Of course, it might also help that Mahoney grew up in England, and that he had a grandfather from Ireland. “I have a lot of Irish in me,” he says. But Mahoney deliberately lost his British accent when he moved to the United States as a young man. This is Mahoney’s second time acting in a McPherson play directed by Randall Arney, after appearing in Arney’s production of “The Weir” at Geffen Playhouse in Los Angeles. In “The Seafarer,” Mahoney plays Richard, the cantankerous brother of Sharky (Francis Guinan), who receives a mysterious visit from a man (Tom Irwin) seeking payment on an old debt. 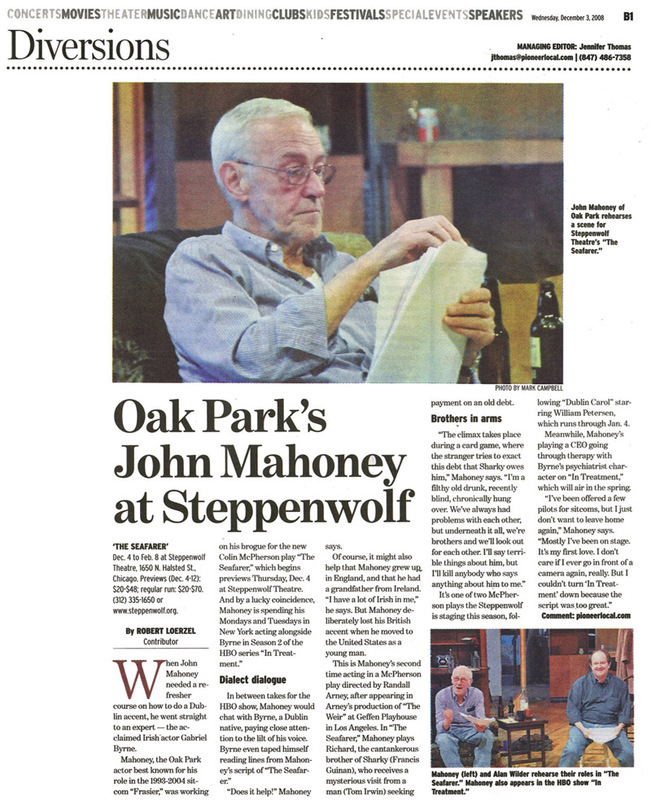 It’s one of two McPherson plays the Steppenwolf is staging this season, following “Dublin Carol” starring William Petersen, which runs through Jan. 4. Meanwhile, Mahoney’s playing a CEO going through therapy with Byrne’s psychiatrist character on “In Treatment,” which will air in the spring.